WerkMaster Releases Video on "How to Repair and Refinish Quartz Countertops"
(PRLEAP.COM) April 16, 2014 - Vancouver, BC - WerkMaster develops a process to refinish and repair quartz countertops or surfaces utilizing the Scarab and a proprietary diamond abrasive resin formulation and design to quickly and professionally refinish damaged quartz countertops. What is the significance of this video? It demonstrates how to repair a quartz countertop in the home, something that up to now has been extremely costly to repair. In many cases, the countertop would be replaced at a tremendous expense to either the fabricator, installer or customer. 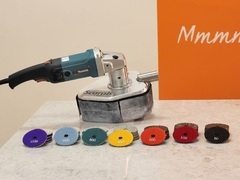 Working with our diamond tool manufacturer and Caesarstone; a unique, proprietary system was developed to effectively do the repairs, quickly, inexpensively while delivering professional results. Caesarstone were the first to develop quartz countertop technology. They have been searching for years for a solution for repairing their products for their fabricators, installers and customers. 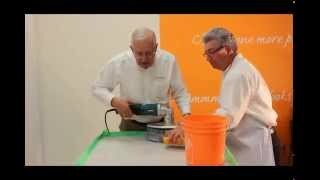 While viewing the video, Bob Cameron of Caesarstone will give you a Step by Step process on obtaining the best results using our proprietary diamond system.